Last night, after having thoroughly enjoyed Miss Conception Goes to the Movies—his latest escapade—at The Palm Cabaret and Bar, I realized he had not been bluffing. If you are in a hurry and/or trust my judgment, I’m going to save you a few minutes of reading, and tell you in three words why this is a performance you do not want to miss: unparalleled production value. For the rest of you, feel free to read on! If I could become anyone I wanted, I would love to be the guy that gets to inspect Levesque’s luggage upon arrival at Puerto Vallarta’s International Airport. Here is a traveling performer that brings everything in tow—from a dozen or-so wigs and costumes, to a smoke machine, and perhaps even a vacuum cleaner—with only one goal in mind: to deliver a one-of-a-kind, one-man show, using 110 percent talent and effort. “I’m having to build a couple headpieces here in Vallarta because they did not fit in my suitcases,” he confided to me only two days before his opening day. If you examine his promotional poster, you will immediately appreciate what he was talking about. Miss C is a consummate entertainer, an illusionist that takes advantage of every available resource—from costumes to lighting—to recreate, in this case, memorable characters from memorable movies. His 15-minute long opening number alone—a salute to all principal characters in MGM’s iconic 1939 film, The Wizard of Oz, in costume, one after the other, nonstop—packs more punch than other performers’ entire shows. No need for green makeup for the Wicked Witch of the West, by the way. It’s all accomplished with proper lighting and staging. Although he is assisted by a backstage crew on occasion, Levesque transforms from one character to the next on stage, unaided, in front of the audience, without missing a cue, allowing those present to appreciate the ingeniousness of his costumes, wigs, and other props used throughout the show. His music tracks have been edited and enhanced with a variety of special effects to immerse audiences in the experience, and clever videos presented during some of the more elaborate costume changes and intermission meld the entire production together as a single, well thought-out production number. A trained singer and dancer, he even throws in a cartwheel or two here and there, for extra measure. Costumes and talent aside, Levesque pays close attention to every little detail, from set decorations to smoke coming out of the Tin Man’s funnel hat—apologies for the spoiler. As a spectator, one can only begin to imagine all the planning and maneuvering that must take place in order to deliver a performance of this caliber. My question to him this year would not be how can he top that—I now know he can—but rather how will he top such an ingenious show. Can we buy tickets for next year’s performance already? By the way, I’m thrilled that Miss Conception has accepted my invitation to participate in The Palm Does Grease, my salute to the popular musical film starring John Travolta and Olivia Newton-John. The one-time performance will take place at The Palm on Saturday, February 27, at 4 pm., and will feature other outstanding local and visiting performers, including Kim Kuzma, Amy Armstrong, Bohemia Viva, Alain Perreault and Piel Canela, among them. 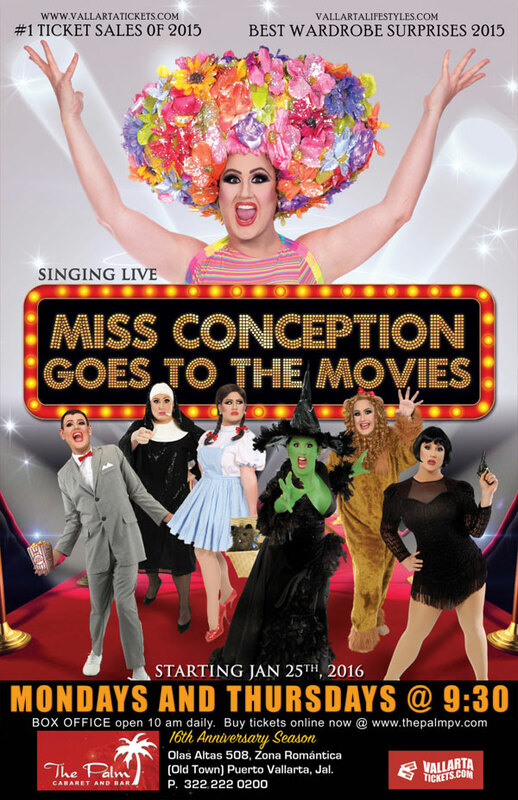 Miss Conception continues performances at The Palm Cabaret and Bar through the month of February. Check the Events Calendar for specific dates and times.